Sally, aka Hot Foot Sally, is a 5½-year-old white and black female born September 16, 2009. Her sire is TK Quick Strike and her dam is Mesa Bebop. Sally has 68 races on record in Florida from July 2011 to July 2012. She then went on to whelp a litter of puppies in April 2013 with sire Dragon Fire. Now she's hot footin' it to retirement! Sally passed an initial cat test and is now living in a foster home with a cat and a small dog. 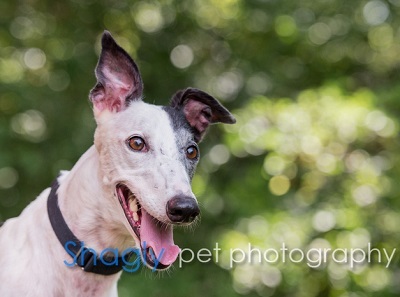 Sally aka Sally the Pretzel, is a sweet, affectionate girl. And she has great house manners—not a single accident in my home and no chewing or anxiety! She defers to the pack in all things; so much so that she gives up her meals to whichever of my girls wants it. So I feed her behind closed doors in my office to make sure she gets her fill. She’s not fussy at all and eats her food, supplements and an occasional treat with relish. She comes up and asks for affection, and loves to jam her head under my arm so I can hold as much of her head and neck as possible. She’s a leaner seems to be particularly happy around men, based on her recent meet & greet behavior. She is friendly to strangers and is great with children. She ignores my cat and gets along fine with my Chihuahua. I’ve been impressed with her ability to adjust to new situations easily and go with the flow. Elevator at Orvis? No problem. Her first meet & greet? She was friendly and affectionate to everyone who came to see her. Car rides? Yes please! She seems to enjoy them and lies down quickly. She does have some quirks. She absolutely refuses to be crated and doesn’t use the dog door. She tolerates the vacuum, but doesn’t care for the noise my Sonicare toothbrush makes. I think Sally could do well in a pack or as an only hound. 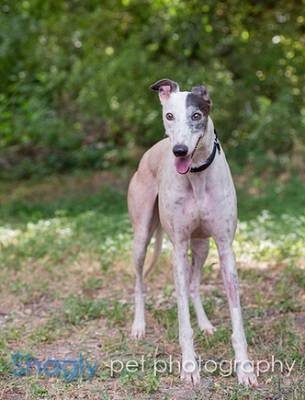 She is very eager to please and will make a great addition to most homes.